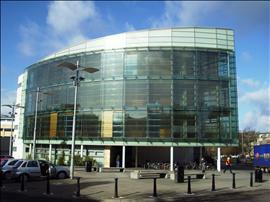 Services / facilities within the building include seminar rooms, refectory, College of Medical, Veterinary and Life Sciences (MVLS) and a Clinical Skills Suite. The dimensions of the Blue Badge parking bay(s) are 420cm x 280cm (13ft 9in x 9ft 2in). The nearest Blue Badge bay is 10m (10yd 2ft) from the main entrance. The maximum height is 215cm (7ft 1in). Access to the car park is via a swipe card. The car park is for the use of permit holders only. You are on Reception (Janitor). Skip to the next section. The reception desk is 4m (13ft 1in) from the front entrance. The infrared hearing assistance systems are fitted in Rooms 253 (Yudowitz), 257 (Hugh Fraser) and 248 (Gannochy). The lift is located within the foyer, past the reception desk. The floors which are accessible by this lift are 1-2-3-4. The lift is 9m (29ft 6in) from main entrance. The dimensions of the lift are 125cm x 140cm (4ft 1in x 4ft 7in). This lift gives direct access to the underground car park from the foyer. The floors which are accessible by stairs are 1-2-3-4. You are on Restaurant Bar Internal (The Atrium - Refectory). Skip to the next section. The distance between the floor and the lowest table is 73cm (2ft 5in). There is a 2cm threshold leading into The Atrium. Staff will inform people as to what is on the menu. Most of the food is on display. The nearest table from the main/accessible entrance is 44 metres away. The accessible toilet is 18m (20yd) from the main entrance. The accessible toilet is located off the Atrium. 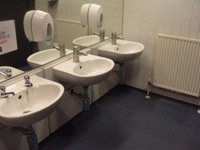 The dimensions of the accessible toilet are 145cm x 190cm (4ft 9in x 6ft 3in). The hand dryer is 126cm (4ft 2in) high. The female toilets are located on the left hand side if the Atrium, as you enter. The female toilets are 20m (22yd) from the accessible entrance. The male toilets are located on the left hand side if the Atrium, as you enter. The male toilets are 20m (22yd) from the accessible entrance. 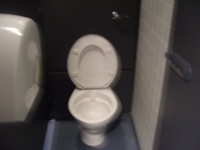 There are additional standard male and female toilets located on floor 4. This building has refuge alerters. Refuge Alerter communication system is designed to summon assistance in the event of a fire evacuation, from University buildings which provide disabled access to upper floors via a lift. All Refuge Points have been provided with details on how to operate the communication system when assistance is required. 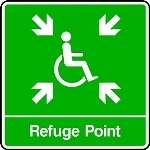 Designated Refuge Point directional signage has been install throughout the building to direct you to these refuges. The refuge alerters in this building are located in/at; Garage West Stair Level 1, Garage East Stair Level 1, Stair 2 Level 2, Stair 3 Level 2, Stair 1 Level 3, Stair 2 Level 3, Stair 3 Level 3, Stair 4 Level 3, Stair 1 Level 4, Stair 2 Level 4, Stair 3 Level 4, Stair 4 Level 4, Stair 1 Level 5, Stair 3 Level 5 and Stair 4 Level 5. There is an assistance dog toilet available on campus for students, staff and visitors. There are 4 assistive software programs available on the Common Student Computing Environment (CSCE). These programs are: MindGenius, Zoomtext, Texthelp (Read and Write) and Kurzwell 3000. The photograph shows the convenient drop-off area.